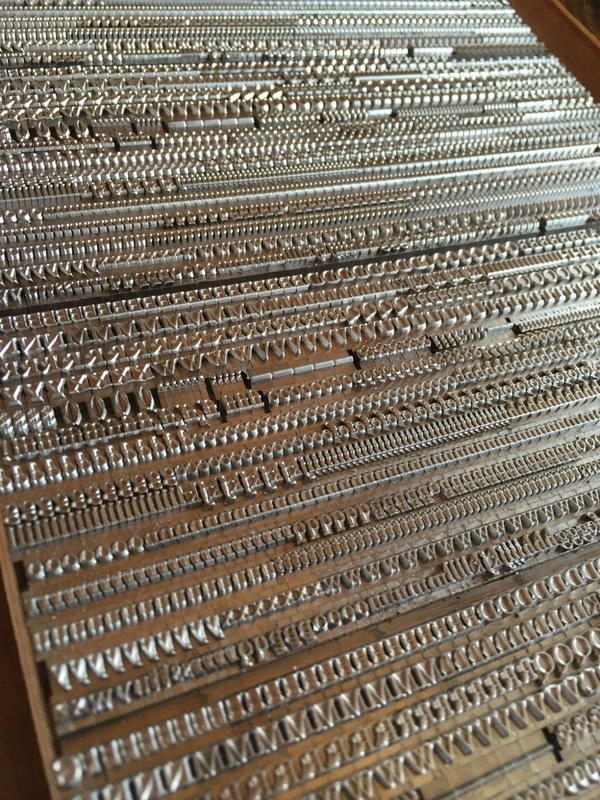 Traditional letterpress printing requires physical letters, cast from metal or carved from wood, which get inked and pressed into paper to make a print. In the next two blog posts, we’ll take an introductory look into how these letters get made. Brand-new metal type, cast last winter for St Brigid Press by Michael & Winifred Bixler in NY. The beautiful package label the Bixler's use for their new-cast type. 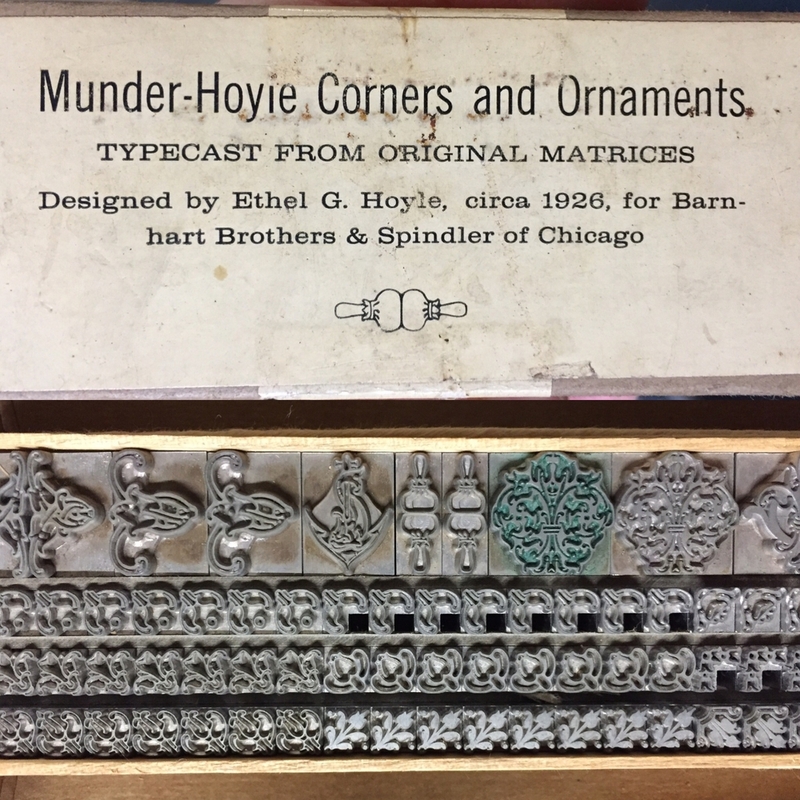 Some of the largest (and most beautiful) metal type we have here at the Press: 60-point Cloister Initials, designed by Frederic Goudy. Some lovely vintage metal ornaments in our collection. Interesting (and well-worn) type from earlier in the 20th century. A place for everything, and everything in its place ~ new type in a typecase. Johann Gutenberg’s big Ah-HA! moment in the 15th century was figuring out how to create multiple letters with which to print, and print again and again — a system of “movable type,” where each piece is cast in a mould from an alloy of metals (lead, tin, and antimony). These pieces, all the letters and numbers and punctuation, etc., of the alphabet, could be used and reused — a huge savings of time, effort, and expense compared to the work of scribes! Metal type wears down over time, because it is relatively soft, and gets scratched or dinged easily. Thankfully for us 21st century printers, some hardy folks are still casting brand new metal type! New-cast type, newly set, waiting for ink! Some of our type comes from a wonderful foundry in Germany, run by the renowned Herr Rainer Gerstenberg. Click the photo below to see an excellent photo-tour of Gerstenberg's foundry, taken by letterpress printer and teacher Thomas Gravemaker. The beautiful Koch-Antiqua typeface, cast for us by Rainer Gerstenberg in Germany, here printed for the colophon of our limited edition book of poems, Soundings. Click the photo for more about Gerstenberg's foundry. So, would YOU like to order some shiny new type?? Here's a list of foundries ready to take your order!